I just wanted to say how much I appreciated the Yom Kippur service last night. It was everything I could want in a service; the stories were meaningful, the energy was good, and the cantor had a striking voice. Thank you so much for making a difference in my life. I want to say that the high holiday services that you led were so well put together and targeted at my age group (I’m 31) because you explain the parts of the services that we say but don’t always understand why. And my favorite is that your stories are thought provoking and interactive. My fiance and I talk afterwards about how much we like that you give the group discussion questions that we can ponder with people we have never met sitting next to us, and then come together again to talk about the discussion. Or commit, by saying out loud, to how we will plan to better the world this year. See you again next year. Wanted to thank you for providing us with this opportunity tonight. My friend and I weren’t sure if we would go to a service this Yom Kippur, but yours came up when we googled “free yom kippur service nyc,” and we knew it would be perfect for our situation. So thank you for providing a free, non-membership, youth-friendly, reform-friendly atmosphere tonight–it was a great way to reconnect to that part of my life. I especially liked the moments you gave us to chat with our neighbors–it captures the spirit of Judaism and injected life into everyone present. Giving us specific things to discuss made conversations less awkward, as well. And saying we could (and should!) talk during the service was shockingly refreshing, though it seemed that most people reverted to the behavior of their childhood synagogue days (i.e. being silent). I don’t know how you could improve that, other than perhaps be reminding the congregation throughout that talking is encouraged? I wish the Ashamnu had been sung at a slower pace; it was about twice the speed I was used to, and I wasn’t able to connect to it very much because it moved by so fast. Maybe that’s why the 12-year old girl thought it was so happy. The repetition of the opening prayer 3 times had the unfortunate effect of mechanizing what had started as a very refreshing, fun service. I’m not sure how rooted in tradition that is, but if there’s a way to streamline more at the beginning, I think it would help keep the congregation engaged more. Loved your stories! Great phrase you had about how a society should be judged on how it treats its least valued members. Again, many thanks for providing an opportunity for my friend and I, as well as the other several hundred people, to feel a part of the holiday without pressure or a shrinking wallet. And thanks for inviting our feedback! I sincerely hope you will continue this in future years! My wife and I attended Kol Nidrei services last week at Ohel Ayalah. This was our second time attending High Holy Day services with your congregation. I write this note to thank you. I grew up in a reformed Jewish household in Westchester. Although I was given a strong sense of Jewish identity as a child, I knew substantively little about my religion. When I later attended college, I pursued a deeper knowledge of my heritage vigorously and tried to live a more observant Jewish life, but found, ultimately, that I didn’t believe in a strict interpretation of the Torah. It all seemed static, immutable and unapproachable. I was left with greater knowledge, but no stronger inner foundation as a Jew. For many years, I have neither attended nor particularly missed observant life, going to synagogue or even thinking of myself as connected to Judaism at all. At the recommendation of a friend, I attended Ohel Ayalah services last year. For the first time in a long while, I began to remember what had drawn me to search for a stronger understanding about Judaism. 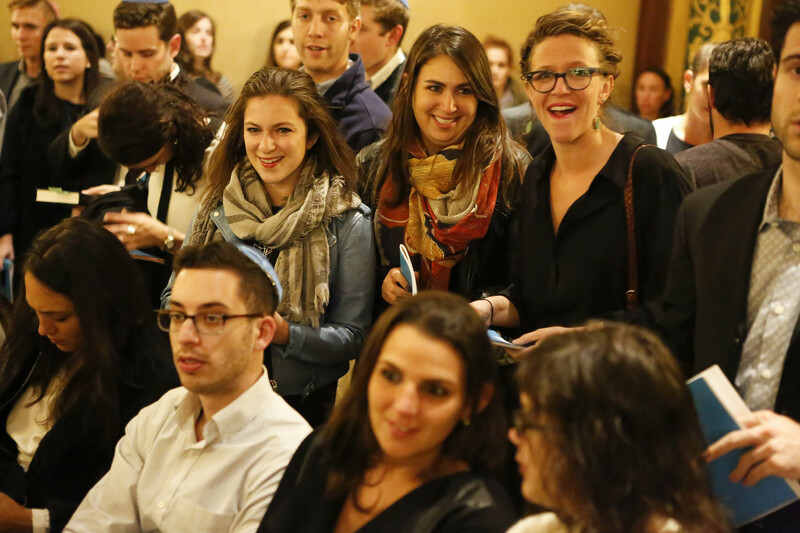 Your services, approach and careful consideration of how to engage (what I imagine is) a largely unaffiliated group of young Jewish people is thoughtful, intelligent and purposeful. At Ohel Ayalah, Judaism is not static, but a living idea, open to true question and stronger and more vibrant because of it. At Ohel Ayalah I feel better about being Jewish than I have in some time. Thank you. My wife and I will be attending services again next year. We look forward to seeing you. We wish you the best of luck with your grant renewal in October. You have the support of many. I just wanted to thank you for conducting such a beautiful service this evening for Kol Nidre. I just moved to the city three months ago, and this is my first time spending the high holidays away from home not to mention attending services alone. Your service was so warm, inviting and familiar, having come from a conservative synagogue back home. It really meant so much to me to be there, so thank you so much for having something like Ohel Ayalah for nomads like me to wander into. A very happy and a healthy new year. May you have an easy fast! I am a 34-year old Jewish man who was referred to your congregation by Rabbi M. K. I must tell you that I have considered myself lax in being an observant Jew, but coming to your services for Rosh Hashanah and Kol Nidre with my fiancee has re-invigorated my connection with Judaism and the ritual of coming to Temple services. I hope to say more in the future, but for now I thought I would share that with you. My fiancee and I wanted to thank you for a wonderful, meaningful and inspiring Yom Kippur service. I grew up in Germany, and there used to be only one Schul in my home town (a city the size of Boston), and 1300 Jews. So it was easy: There was one place to pray, and one way of praying, and that was where everybody went and what everybody did. I have been in the US now for 8 years, and the high holidays always make me feel like I am a misfit: The focus of services I attended here in the past was always on “selling” something. Either people wanted to get donations (in addition to the hefty fees for the services), or they wanted to ‘sell’ their brand of Judaism and world view, or they wanted to just feel important. I wanted to thank you, because this service was the first time that I felt at home away from home, and the focus was truly on the essence of the holiday, not on self-important community elders or money or weird sects proselytizing on the fringes of Judaism. We noticed that Ohel Ayalah is associated with the UJA, and we both feel that this endeavour is yet another wonderful project that makes the UJA a worthwhile cause to support. So once again, thank you, and please continue the work you are doing with the wit, warmth and enthusiasm we witnessed on Sunday night! PS: While you are a giant in sprit, please bring plateau shoes next time, so we can see you better in the back row! Thank you, again, for a wonderful service. I was the one who came up to you at the end of the 6:30 Kol Nidrei service and let you know that you are the only Rabbi, EVER, that has made going to Temple enjoyable! So, thank you, thank you, thank you and L’Shana Tova. My daughter moved to New York from California a year ago. After calling, and going to, TEN synagogoues throughout the city regarding attending high holiday services this year she called home to tell us she was “mad at my religion”. Services were either “sold out” unaffordable or there was general disinterest in accommodating a poor 20 something couple. Then she found YOU! She was thrilled with the service on Rosh Hashanah and is eagerly anticipating Yom Kippur. You have renewed, and invigorated, her faith. Thank you so very much for all you give to the otherwise disenfranchised Jewish Community of New York…this is what Judaism should be…. My sister and I were raised reform in the U.K., and though I’ve been to a few synagogues in New York since I moved here two years ago, this was the first service I walked into where I felt welcomed and instantly part of a community – familiar and warm, and so solid that it didn’t seem like a room full of strangers. My boyfriend, who isn’t Jewish, came too. He was equally welcome and felt comfortable enough to join in. The spiritual significance and modern relevance of the evening was communicated so enthusiastically, and the music was so beautiful, that it became an easy and joyous evening to share, rather than an awkward one. I moved to New York City three years ago, after graduating from college, and spent the past two years searching for a welcoming, spiritual (and, of course, budget-friendly) high holiday service. I finally found it this year at Ohel Ayalah. Both the Rosh Hashanah and Yom Kippur services were reminiscent of ancient traditions and relevant to modern day, a spiritually-meaningful, community-based experience. With my family across the country in Seattle, Ohel Ayalah provided a much needed warm home in which to spend the holidays. Thank you so much for offering these services – I’m so glad to have found them and will definitely return in the future. My wife and I attended Kol Nidre/Yom Kippur day/Ne’ilah services through Ohel Ayalah this year and were quite pleased with both the services (quite similar to the conservative services I have attended since my youth) and the attendees (I have found many young professional-oriented Jewish groups are more of a dating service than a religious group). While our jobs have us traveling quite a bit, we hope to experience your friday night services in the coming year! At Jason’s study session before Ne’ilah, at least 2 people said something like, “When the rabbi talks, I really identify with what he’s saying and it makes me think about my life. Normally I just fall asleep.” Another woman (20s) came up to all 3 of us after Kol Nidre and told Josh that she had always thought exactly what he said in his sermon (That YK is more about relationships and defining life values than about sin). She said she had told many people about her point of view, and most people brushed her off. She was delighted to find a rabbi who legitimated her own personal thoughts about the significance of YK. One woman said “I am skeptical of religion, but I wanted to come and learn a little more about it.” She was my chevruta in the text study, and really seemed to identify with the text of yissurin shel ahavah, especially the part about how caregivers (R. Yohanan) can become burned out and weakened themselves. She is an attorney for children in the foster care system and identified with that feeling. One person (late 20s), asked me if we do services in Brooklyn on a regular basis. One woman (mid-20s) came up to me afterwards and asked about Jewish resources in Brooklyn. She said she was trying to get involved, but had had difficulty finding places to go. It was after Neilah, so I got her email address. him there. She asked us to put in “as many Mourner’s Kaddishes as possible.” There were others who came from the Bronx, Queens, and upper Manhattan – making a pretty big effort to get to services! 1) A number of people (at least 3 to me) said, “You should have regular davening here” — I took this to mean that there’s a real group of people searching in Brooklyn, and that what we provided was better than anything they’ve found there. 2) I received literally hundreds of ‘thank-you’s over the course of the holiday. 3) During Neilah, there was a woman in the coffee house upstairs reading, whom (during one of my trips upstairs to bring food from the refrigerator down for the break-fast) I spotted peeking through the curtains to the service. I invited her down. First she came onto the steps in the back, and then I invited her further down, and she took a mahzor and spent more than 30 minutes in the service. She really summed up what we’re doing – reaching people who are literally in a coffee house during Neilah and bringing them in! “I am new to Brooklyn, 32 years of age, female. I was walking home along 4th Ave and came across a sign at the Brooklyn Lyceum for Yom Kippur Services and Break Fast. Simple as that. BUT, it was perfect . . . I was able to not only reconnect but also feel the familiar buzz of the holiday as the rabbi and cantor led services using the same melodies I grew up with in Los Angeles! (that was the highlight).” – O. I. “Last night’s Kol Nidre experience revived a latent love of Judaism–thank you. I’m 28 and probably have not attended a High Holiday service in about a decade. The lively and engaging qualities of your service have inspired me to seek more. . . I look forward to more rousing music, provocative stories and instructive context.” – M. C.
"Thank you for a great opportunity to enjoy the New Year in a comfortable and welcoming atmosphere!"